The name V9 Bobber evokes concepts such as its essential line, pure design and thus a certain original sporting content, underlined by numerous details in a total matt black look. 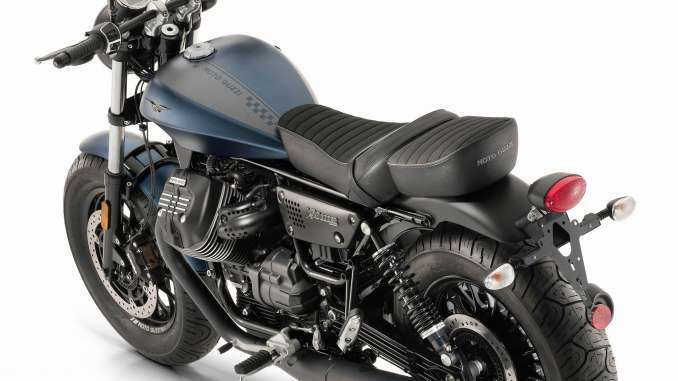 This Moto Guzzi sports custom effectively inaugurates the mid-size production bobber segment. Bobbers appeared in the United States after World War II, built by passionate riders who stripped away all details superfluous to their goal of running fast on dirt tracks. To compete in these conditions the riders used to mount oversized tyres, giving the bikes a wide footprint. In line with this style, the V9 Bobber abandons any chrome plating and glossy finish for matt black details. Therefore, the side fairings are black as night, as is the exhaust assembly, the mirrors and the metal rear mudguard; The latter has been carefully shortened and reduced in size, so as well as including a very compact optical unit, it makes a big contribution to the minimal look of the V9 Bobber. The matt black wheel rims, both 16 inches, are elegantly decorated with the Moto Guzzi logo in grey; the front rim is shod with a tyre that has an oversized shoulder (130/90). Even with these spectacular tyres and distinctive design, the bike still maintains characteristics of exceptional riding pleasure and handling. Indeed the V9 Bobber is a true Moto Guzzi, and as such does not trade rideability for beauty. The V9 Bobber also differs from the V9 Roamer with its more crouched and sporty riding position provided by the low drag bar painted black. The set back aluminium footpegs guarantee a more active and erect posture and ensure more space and comfort on board, even for taller riders. The 2018 generation of the V9 Bobber, despite the single-seater, aggressive look, is ready and approved to carry a passenger: in fact, the passenger portion comes as standard equipment, removable as are the passenger footpegs, in order to make the V9 Bobber a true one-seater. The ground clearance of the latter is only 785 mm, and if you add to this the low total kerb weight of 199 kg, it is not hard to imagine the level of comfort, control and riding pleasure the V9 Bobber provides. – Riding pleasure in all conditions, granted by the recognised superior riding qualities all Moto Guzzis that have captured the hearts of generations of users on roads around the world. That same motorcycle culture inspires the two Moto Guzzi motorcycles. V9 Roamer is a universal easy and intuitive custom, beautiful to show off and rewarding to ride, full of unique details and outstanding finishes. The V9 Bobber expresses an altogether darker and more nocturnal soul. It has large tyres and as a total black look. The 2018 V9 units, the result of the constant perfecting that Moto Guzzi dedicates to its bikes, are distinguished by a marked difference, with two clearly distinct personalities: one more touring and the other sportier. The V9 Roamer in particular, takes an even deeper look at long road trips, introducing a protective top fairing and new rear shock absorbers designed to increase two-up travelling comfort. Both of the V9 machines obviously have an entire range of touring accessories. With such explicit references to style and technology recurrent throughout the history of Moto Guzzi, the V9 could only be beautiful, fun and safe. In particular, Moto Guzzi has focused its greatest efforts on the definition of a design that would enhance the sculptural forms of the twin-cylinder 850 made in Mandello. In addition, a great deal of attention was paid to perceived quality: Exceptional care has gone into the finish and components on the V9 Roamer and V9 Bobber. They represent a new way of conceiving the medium-sized motorcycle. Touching the surfaces, we can feel the wide use of high quality materials such as steel and aluminium, while plastic parts are reduced to a minimum. The metal teardrop fuel tank on both V9s, with its 15-litre capacity, is finished with a fine coating with the Moto Guzzi logo on top, protected by clear varnish. The front and rear mudguards are also made of metal. However, the side fairings, locking fuel tank cap and brake and clutch levers are made of lightweight aluminium. the ergonomic electrical blocks also have aluminium finish housings, just as the rider footpegs are made of aluminium. The steel exhaust manifolds are protected by a second tube, which, by creating an air cavity, helps to lower the heat emitted and preserve the outer surfaces. 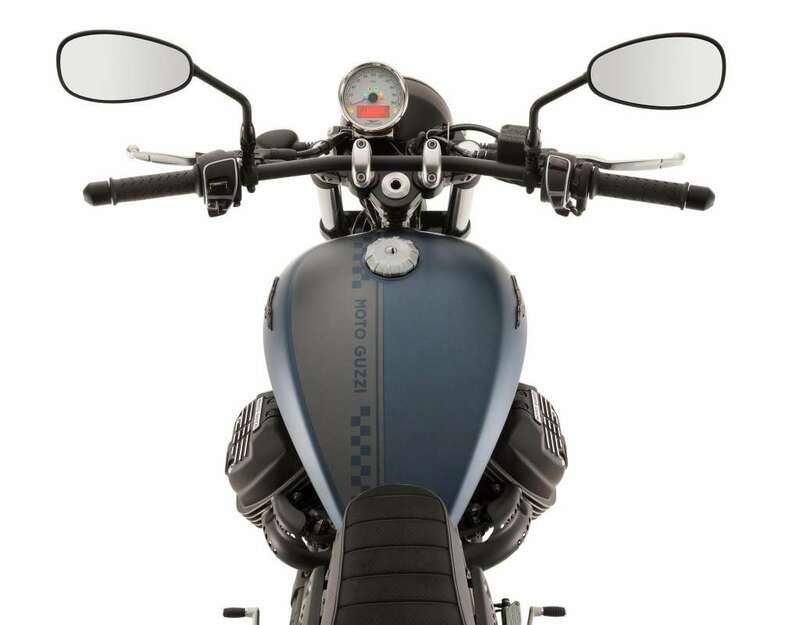 The welds of the new frame and the quality of its paintwork are immaculately finished, as are the meticulous details of the 90° transverse V-twin engine, not only in terms of the casting but also the matt black that brings out the Moto Guzzi branding milled on the aluminium cylinder head covers. It pays to look at the intimate details of these two motorcycles, their touch conveying the entire construction tradition and culture so typical of the best Moto Guzzi models. The 2018 V9 Roamer and V9 Bobber versions are fitted with a Moto Guzzi 850 cc engine, built as always in the Mandello del Lario plant. This is of course a 90° transverse V-twin air and oil cooled engine, a set-up used in all current Moto Guzzi engines, albeit with different engine capacities and performance, able to ensure excellent riding dynamics and a unique sound. It was developed with the explicit aim of maximising torque and elasticity, key aspects for ensuring riding pleasure and on road fun. Starting from the bottom of the engine, the aluminium crankcase stiffened at the key points, has an efficient oil pan and an inertia calibrated crankshaft for liveliness and the correct engine braking. Inside the lubrication system is designed to dispose of the greater heat capacity and reduce power absorption to the benefit of both performance and fuel consumption. The ventilation system reduces power loss due to pumping within the crank chambers and a low flow oil pump that absorbs less power. The oil pump intake duct is unprecedented, as well as the related bypass valve; New piston cooling oil jets are also used, fitted with a control valve and flow management. The alternator cover is also unique and now includes the blow-by gas output. In the upper part of the engine, aluminium heads, pistons and cylinders are designed to make the most of the engine’s characteristics. Its cubic capacity is obtained due to bore and stroke values of 84×77 mm. Timing is controlled by a rods and rockers system and uses 2 valves per cylinder arranged at an angle in the head. The fuel supply uses a one-piece Marelli electronic injection system, managed by the specific ECU. 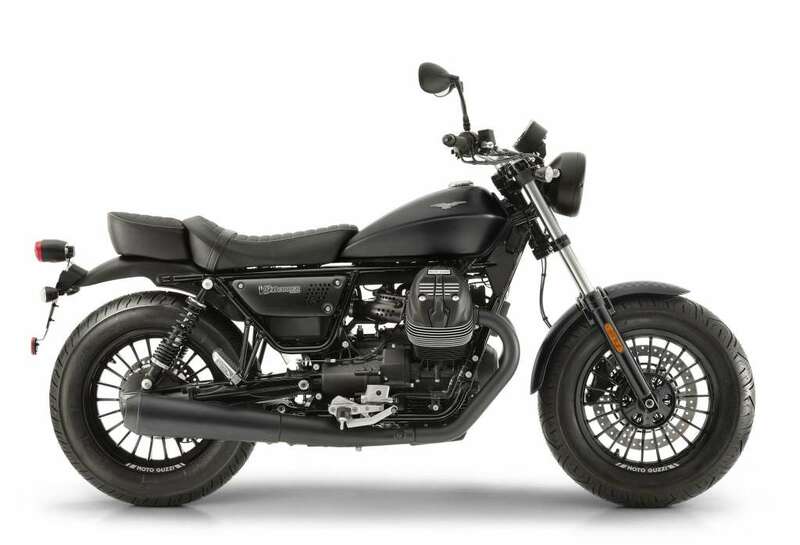 Of note is the presence in the entrance heads of the auxiliary air system, which, combined with the three-way catalytic converter, the double lambda probe and the total design of the engine, bring the twin 850 Moto Guzzi into compliance with Euro 4 standards. The unit is capable of 62 Nm of torque at just 3,000 rpm, with a maximum power of 55 HP at 6,250 rpm, figures ​​that show Moto Guzzi’s commitment to achieving high levels of torque even at low rpms. This engine boasts surprising character and responsiveness, which contribute to a really exciting riding experience. A version with limited power is available, in line with the limitations of the A2 license and ideal for new Guzzi riders, who can also enjoy a record low total weight and the general ease of riding of both V9 versions. Carlo Guzzi was probably the first to understand the importance of a frame able to exploit the full potential of the engine and a suspension unit that responds perfectly to the imperfections in the road surface. Indeed, the Norge GT of 1928 was the first motorcycle with a “spring frame”, equipped with front and rear suspension, bringing enormous advantages in terms of safety and riding pleasure. The Moto Guzzi tradition is full of models recognised for their excellent ride qualities: in terms of custom motorcycles, we should really mention the California, which in 1970, under the name V7 Police, was bought by the LAPD (Los Angeles Police Department) after a series of tough tests. On the back of this tradition, Moto Guzzi now builds motorcycles like the V7 III and the fleet of the big 1400s, which are real benchmarks in terms of handling in their respective segments. The V9 is another jewel from Moto Guzzi for riding pleasure and effectiveness. The steel twin tube cradle frame, creates optimum weight distribution on the front and rear of the engine, thereby providing the rideability and dynamic balance typical of all motorcycles built at Mandello del Lario. The designers paid special attention to the front, which has gussets in the steering head and new slope and trail abilities, making for a superb ride with the perfect combination of handling and stability, as well as precision and feeling. In addition, the entire structure benefited from painstaking care and finishing of the details, including the welding and paintwork. The suspension systems use traditional long-travel (130 mm) inverted forks and a new pair of spring preload adjustable shock absorbers connected to the frame, which provide a gradual and controlled response at all times. The braking system is customised for the V9: the front end adopts a master cylinder and a Brembo opposed 4-piston calliper that grips a 320 mm steel disc; the rear mounts a 260 mm disc and a two-piston floating calliper operated by a master cylinder with built-in reservoir. Like all recent Moto Guzzis, the V9 also has a full set of advanced electronic systems, placed very discreetly inside the vehicle, making riding safer and easier. The motorcycles come with a standard advanced two-channel ABS, non-invasive in normal riding, but that prevent the wheels from locking when really needed and the well-known MGCT (Moto Guzzi Traction Control), Moto Guzzi’s advanced traction control integrated with the electronic engine management system and adjustable in two different levels of operation and that can be deactivated, ensuring better grip of the rear tyre on any road surface, reducing engine torque if necessary through a reduction of the advance of the engine. Other standard features include an immobilizer and USB port located under the steering head, useful for charging external devices. The electronic instrumentation, made up of a single circular display, is also consistent with the style of the two the V9s. The speedometer has an analogue dial, while all other information is contained in the digital box: odometer, partial trip and daily trip (with automatic reset after eight hours after shutdown), the trip time, instantaneous and average fuel consumption, clock, outside temperature, average speed, MGCT level, in addition to the gear position and shift indicator, whose idle and maximum value can be adjusted by the user. This way, you can keep a determined engine rpm range under control, for example to run in the bike as effectively as possible or to reduce fuel consumption to a minimum. The extensive catalogue of accessories includes the MG-MP, the Moto Guzzi multimedia platform that connects a smartphone to the vehicle to provide an exceptional quantity of information useful for the journey. You can record trip data and review it on your computer or directly on your smartphone, analysing the distance covered along with the vehicle’s operating parameters. The system also allows you to easily locate your vehicle when you park in a strange place, automatically saving the position where it was switched off. MG-MP includes the “Grip Warning” function which replicates the indications on traction control operation for maximum visibility and provides information in real time on your riding performance with relation to the road surface conditions. A dedicated indicator light warns in the event of excessive use of available grip. Thanks to the synergistic use of gyroscopes and the information coming from the vehicle, the smartphone becomes a sophisticated instrument to measure the lean angle in turns thanks to algorithms developed specifically for this Moto Guzzi. The limit thresholds can be set both for lean angle as well as vehicle and engine speed. When these limits are exceeded the relative indicator lights will come on or the virtual dashboard will flash. 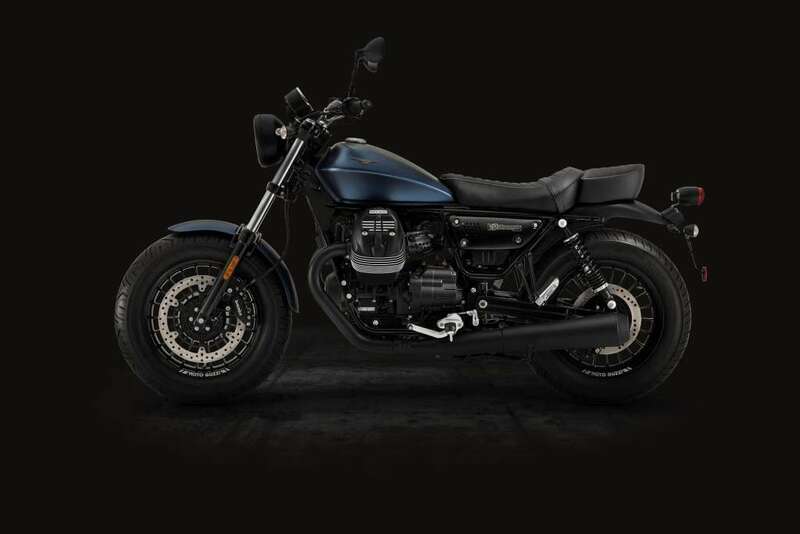 The 2018 Moto Guzzi V9 Roamer is available in two different colour variants, both with a glossy finish: Verde Nobile and Grigio Eleganza, with glossy black front and rear mudguards. The 2018 Moto Guzzi V9 Bobber is available in three colours, all with a completely matt finish: Blue Impeto, Nero Notte and Grigio Tempesta. 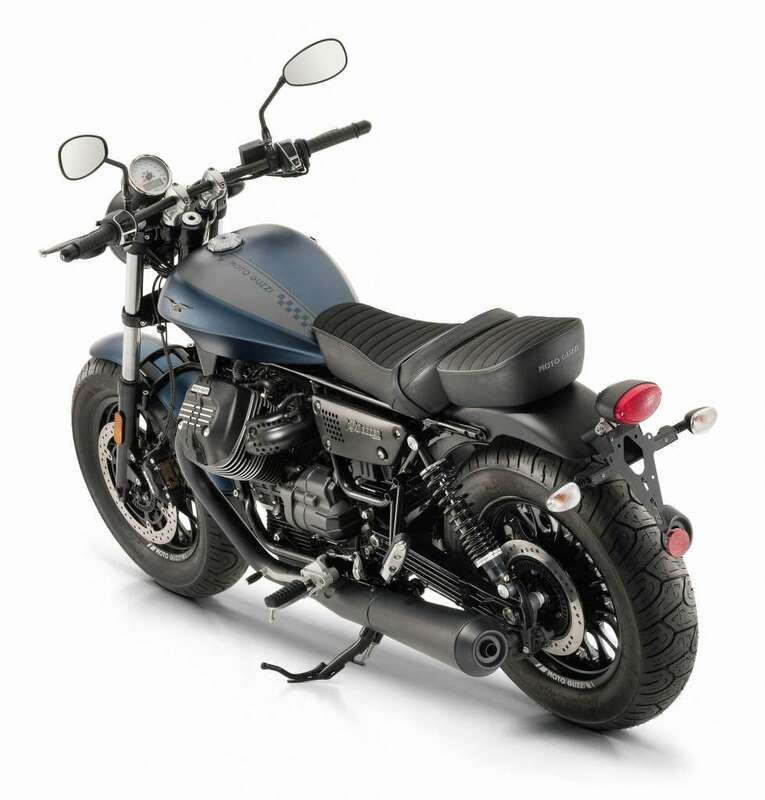 The two V9s can also be widely customised, drawing from the vast range of genuine Moto Guzzi accessories. The details are designed and engineered by Moto Guzzi and undergo strict testing cycles, like any other original motorcycle component, in order to ensure quality and reliability. They are perfectly interchangeable with the standard parts and allow easy restoration of the motorcycle to its original state. They are rigorously approved and thus totally “street legal”, allowing you to customise your bike without voiding the warranty. The more classic style of the V9 Roamer is customisable with a range of accessories for tourism, such as the set of leather saddlebags and a single bag (always in leather) to be fitted on a dedicated chrome luggage rack. A split saddle with comfort inserts is also available. There is a wide range of choices of special high-quality aluminium billet parts, including the grips, brake and clutch levers, the rider and passenger footrest covers and the pair of rearview mirrors. Handlebar riser covers: made from billet aluminium, these enhance the rider’s position, providing an even more relaxed ride. Aluminium front brake lever: made from billet aluminium, this allows you to adjust the distance of the lever from the grip. Aluminium clutch lever: made from billet aluminium, this allows you to adjust the distance of the lever from the grip. Front brake master cylinder cover: made from billet aluminium, this can be easily mounted without opening the reservoir. Aluminium hand grips: these are made from billet and allow a secure and comfortable grip. External mirrors: with an elegant line, these are made from billet aluminium and the ensure a wide adjustment range. Stock mirror thread cover: made from billet aluminium. These cover the threaded seats for the stock mirrors. Fork caps cover: made from billet aluminium, these give the fork plate an elegant and precious look. Lower fork plate cover: Laser cut with special aesthetic grooving, it boasts prestigious black paint and the Moto Guzzi logo in white. Front fender bracket: made from billet aluminium. A quality, sturdy element with a high level design. Chromium headlight frame: Modern design cover, laser cut and shaped to blend with the front headlight design. Front frame screw covers: made from billet aluminium, these give the bike a further touch of elegance and prestige. Voltage regulator cover with horn cover: made from billet, satin-finish aluminium. Brings out the sleek and slender line of the bike. Head protection covers: made from billet aluminium, these protect the top part of the engine. Exhaust manifold ring nut covers: made from laser cut steel, these enhance the front part of the exhaust. Rear brake pedal: another part made from precious billet aluminium. Rear brake master cylinder cover: an elegant and refined part, made from billet aluminium. Rear brake master cylinder protection: made from black finished aluminium, this encloses and protects the rear brake master cylinder area in elegance and style. Rider footrest covers: made from billet aluminium, these give the footrests a more elegant appearance and guarantee a stable and safe support thanks to special milling. Passenger footrest covers: made from billet aluminium, these give the footrests a more elegant appearance and guarantee a stable and safe support thanks to special milling. Rider comfort saddle: this gives the bike a more sporty and enhanced look, optimising seating comfort thanks to special padding. Passenger comfort saddle: optimises seating comfort thanks to special padding. Black luggage rack: the ideal support for small luggage or the dedicated top box. Tank cover with bag: in top quality leather, this precious combination of tank cover and bags blends perfectly with the bike’s line and provides a significant increase in carrying capacity. Semi-rigid top box bag: this is made with an elegant combination of leather and technical fabric and it attaches to the V9 Roamer dedicated luggage rack. Complete leather and Touring side panniers kit: thanks to the side frames with fast click quick release system, you can use various types of side panniers on the V9 Roamer. The Moto Guzzi accessories range offers a pair of precious, handcrafted bags with steel buckles and the hot-stamped Moto Guzzi logo, a pair of Touring bags in technical fabric which are rugged and spacious enough to make them an indispensable item on long road trips, as well as a pair of water repellent Canvas bags that give the bike a unique look. All the bags have a rapid release and anti-theft system. Electronic anti-theft system: this compact and advanced control unit is discreet, easy to install and comes with a remote control. The system is self powered with a minimum energy absorption. MG-MP: this is the device that allows you to connect your smartphone to the bike, transforming it into a true multimedia platform. Top fairing: designed specifically for the V9 Bobber lines, this increases travelling comfort thanks to better wind protection. DOT and TUV approved. Headlight cover: made from laser cut aluminium and painted black, shaped to follow the muscular lines of the V9 Bobber, this provides greater protection from the wind and gives the vehicle a more aggressive look. Front brake lever: made from billet aluminium, this allows you to adjust the distance of the lever from the grip. Clutch lever: made from billet aluminium, this allows you to adjust the distance of the lever from the grip. Front brake master cylinder cover: made from billet aluminium. This can be easily mounted without opening the reservoir. Approved slip-on exhaust: This exhaust dedicated to the V9 Bobber is painted in an aggressive matt black shade and it lets you accentuate the unmistakeable sound of the twin-cylinder from Mandello. The end of the exhaust is finished in aluminium with an oblique shape. Low 2 in 1 Arrow exhaust: the low 2 in 1 exhaust designed in collaboration with Arrow lightens the V9 Bobber design, giving it an even sportier look. Black or copper exhaust covers: designed to completely wrap the V9 Bobber exhaust manifold, these further accentuate the bike’s aggressive style. Shock absorber covers: mad from billet aluminium, these covers make the rear end of the V9 Bobber even more precious. Semi-rigid top box bag: this is made with an elegant combination of leather and technical fabric and it attaches to the V9 Bobber dedicated luggage rack. Complete leather and Touring side panniers kit: thanks to the side frames with fast click quick release system, you can use various types of side panniers on the V9 Bobber. The Moto Guzzi accessories range offers a pair of precious, handcrafted bags with steel buckles and the hot-stamped Moto Guzzi logo, a pair of Touring bags in technical fabric which are rugged and spacious enough to make them an indispensable item on long road trips, as well as a pair of water repellent Canvas bags that give the bike a unique look. All the bags have a rapid release and anti-theft system.